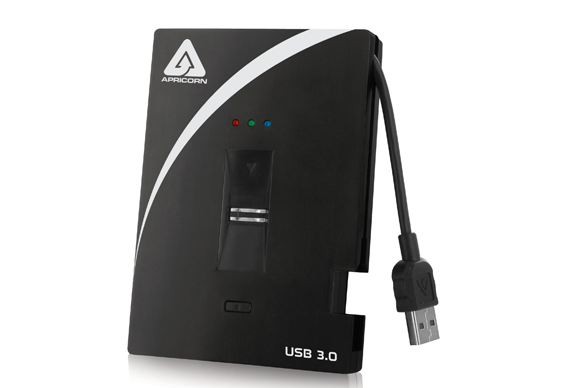 Apricorn’s Aegis Bio 3.0 pairs solid performance with enhanced security features to create a nice, all-around external hard drive. The Aegis Bio harnesses biometrics to make sure you (and only you) have access to your data. The pocket-sized hard drive comes with a built-in fingerprint scanner than helps alleviates any worries of unapproved access to the drive. Fingerprint access might sound like a bit of a novelty, but from a security standpoint it actually makes sense; passwords can be cracked—fingerprints, not so much. It’s more expensive than other portable drives—the 1TB Seagate Backup Plus can be for just over $100—but the Aegis Bio is aimed at users with security concerns. 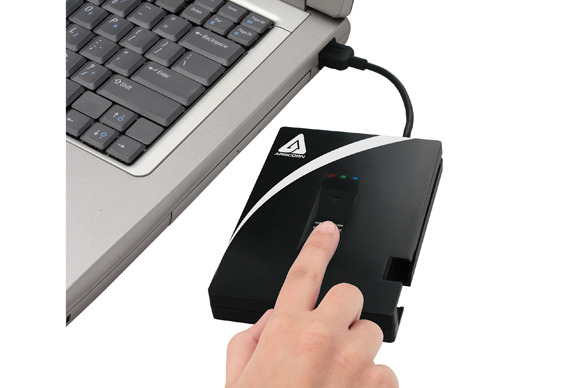 You can add additional fingerprints at any time, but as a sort of confirmation, you first must scan a fingerprint that is already registered with the drive. If the Aegis Bio 3.0 has five registered fingerprints and you want to remove and/or add new ones, you have to completely reset the Aegis Bio 3.0 and rescan the prints. Performing the full reset on the system will wipe it clean of all data and stored prints. Seems like a hassle, but it’s actually a nice little feature that insures that your data will be safe and private even if the drive gets stolen. After the fingerprints have been enrolled, unlocking and accessing the Aegis Bio 3.0 is a breeze with one slow swipe of your finger doing the trick—usually. Locking the drive is just as simple and is done by pressing and holding down a button located directly under the scanner. The Aegis Bio 3.0 uses power from the USB port and no extra software is needed to get the drive’s biometric features up and running. Just plug it in and the 256-bit AES encrypted hard drive is good to go. In terms of speed, the Aegis Bio is a speedy little drive. It comes with built-in USB 3.0, which makes transferring large files to and from the drive a breeze. Macworld Lab used AJA System Test to clock the Aegis Bio’s write speed at 103.2 MBps and its read speed at 105.3 MBps. This beat other external drives with USB 3.0 connections that we’ve tested, such as the 1TB G-Technology G Drive Mobile and the 1TB Seagate Backup Plus. Motor sounds from the drive were hardly noticeable throughout the tests, and the unit remained relatively cool. The Aegis Bio is available in three different size capacities: 500GB ($199), 700GB ($219), and 1TB ($249). It’s more expensive than other portable drives—the 1TB Seagate Backup Plus can be for just over $100—but the Aegis Bio is aimed at users with security concerns. The Aegis Bio 3.0 is a hard drive meant for users who want to make sure that their files remain secure, and are willing to pay for it.